SMA Sunny Boy 240 microinverter delayed again until 1Q13. New transformerless TL-US series inverters provide emergency daytime power during grid outages. 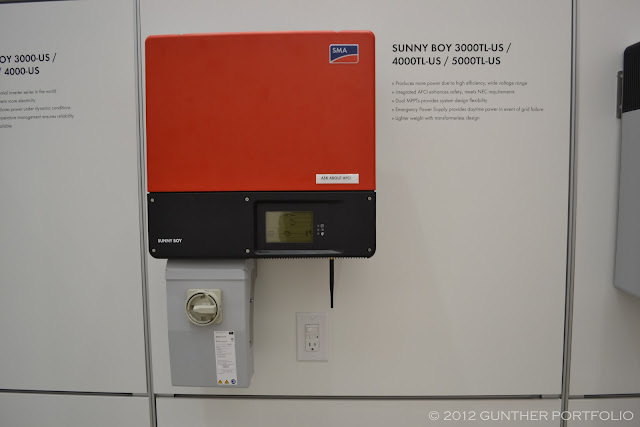 The Sunny Boy 240 is in the midst of US field trials that SMA said are going well. While SMA said the Sunny Boy 240 microinverter system is in the final stages of the launch process, unofficially I heard product changes were required for UL compliance. Photovoltaic (PV) modules with microinverters were displayed at the SMA stand and illustrated the cabling arrangement with the Y cable DC module input to the left, center AC daisy chain input, and AC daisy chain output to the right when viewed from the back of the module. The last Sunny Boy 240 AC daisy chain output connects to the Sunny Multigate-US providing the electrical interface for the daisy chain to the main service panel. Perhaps revealing a limitation, SMA has reduced the maximum number of Sunny Boy 240 microinverters connected to each Sunny Multigate from the expected 15 to 16 units at SPI11 to a daisy chain of up to twelve (12) resulting in a 2880 Watt maximum AC power rating per Multigate. 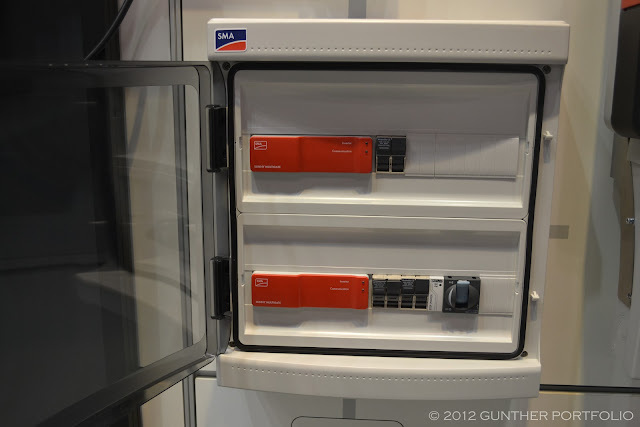 SMA envisions the majority of installations with up to two (2) Multigates and displayed a clear cover wall panel with the Multigates, fuse terminal blocks, and a disconnect switch. 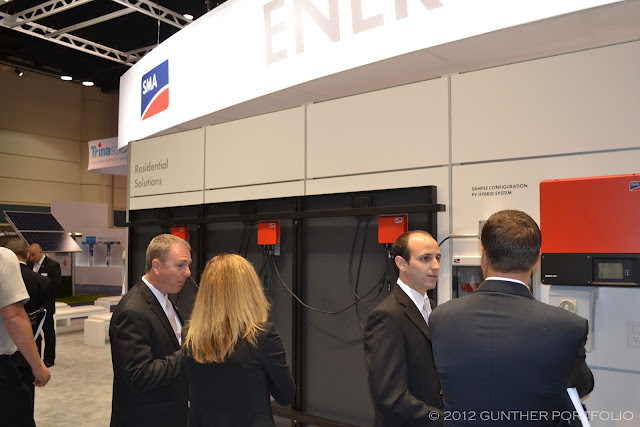 SMA did not demonstrate the module level monitoring software or configuration process at the stand. SMA said: “The monitoring software and tools are not yet public. They have been tested and shown but not to a broad public audience.” A dashboard monitoring screenshot was included in the Sunny Boy 240 printed brochure handed out at SPI12. SMA was promoting a hybrid approach using microinverters just where partial shading or complex roofs require them and string inverters for the majority of PV modules. The stated goal of the SMA hybrid approach was to optimize cost, performance, and Operations and Maintenance (O&M) in order to maximize return on investment. One installer I chatted with thought the hybrid concept was a nonstarter in most residential installations. Larger commercial rooftop installations might benefit from the hybrid microinverter and string inverter combination. 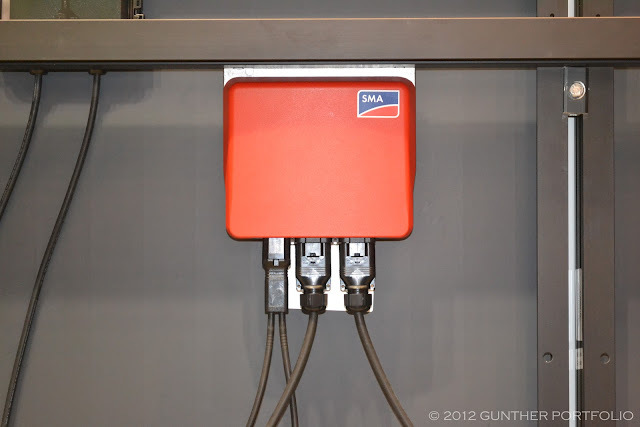 SMA will manufacture the Sunny Boy 240 microinverter at the SMA America Production, LLC, facility in Denver, Colorado USA, and SMA America will also launch the microinverter product line. The Fastest Time To Install A Residential Solar Photovoltaic System at RecordSetter.com was achieved by Sierra Pacific Home and Comfort installing a twelve (12) module 2.82 kiloWatt (kW) solar photovoltaic SunSnap System from Sharp Corporation (TYO:6753). The SunSnap AC modules integrate discrete microinverters and Zep Compatible frames to simplify scalable solar installations. According to SMA, the one hour, fifteen minutes, and 48.17 seconds pending record installation used the Sunny Boy 240 microinverter system. 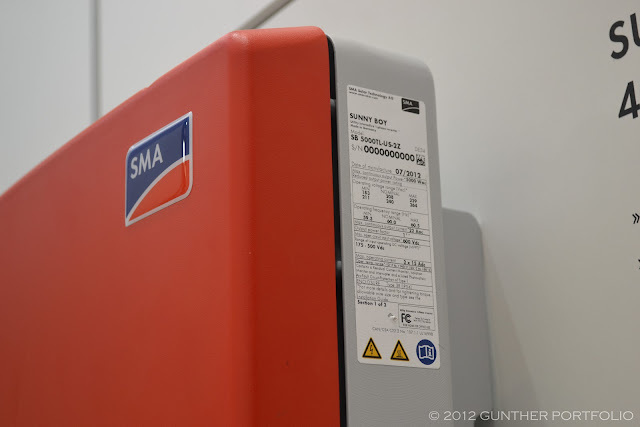 SMA will begin limited shipments of the transformerless Sunny Boy 3000/4000/5000TL-US-22 inverter series for 3 to 5 kiloWatt rated AC power PV systems in 4Q12. The TL-US series has added a unique Emergency Power Supply feature providing daytime power to a dedicated power socket in the event of a grid power outage. The power socket is isolated from the grid during the outage and supplies up to 12 Amps so long as the PV system is generating. Grid tied inverters without battery storage support are supposed to shutdown during grid power outages to prevent islanding. SMA developed the feature in accordance with solar inverter specifications required to enter the Japanese market after the Fukushima Daiichi nuclear disaster. The TL-US series integrate DC AFCI (Arc-Fault Circuit Interrupter) protection meeting the requirements of National Electrical Code – NEC 2011 690.11. I was told the TL-US has a revised CEC efficiency of 97% since the preliminary product datasheet was released. 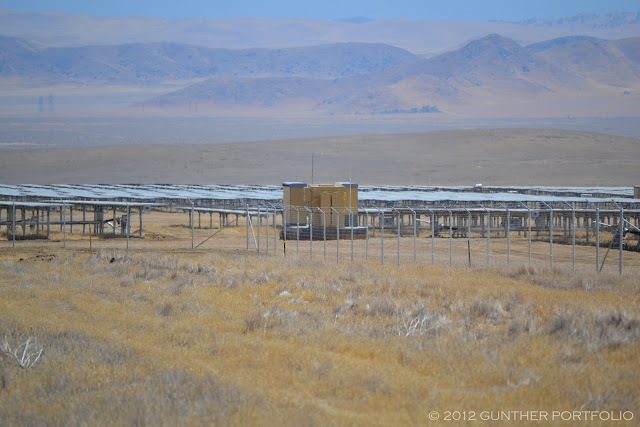 Well, multiple sources have confirmed the SunPower Corporation (NASDAQ:SPWR) Oasis 1.5 MW AC Stations I saw at the 250 MW California Valley Solar Ranch (CVSR) project were sourced from SMA America and manufactured at the Denver manufacturing facility much like those for another vertically integrated utility-scale PV power solutions provider.